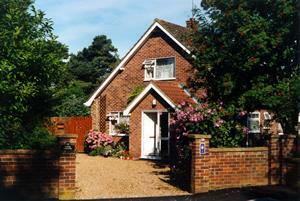 Three Corners is a chalet/bungalow with 2 guest bedrooms on the upper floor. The garden is large, beautiful and well maintained. The guest bedrooms share a large toilet and washroom, with similar facilities on the ground floor. Each bedroom has a TV and radio and is supplied with a refreshment tray. Although Holt has restaurants of all descriptions, we are happy to provide an evening meal when required. Open all year. Three Corners is close to Gresham's School and hence is convenient for parents visiting pupils of the school. Minimum age limit for children is 5, but babies are accepted. Cycle storage available. From Holt centre, take the Old Cromer Road. Immediately after a pedestrian crossing (by Gresham's Preparatory School) turn left onto Kelling Road (signed Kelling and Weybourne). Then take the third left (Kelling Close) and find us at the end of the road (100 metres). If using the Coast Road (A149), turn inland at Weybourne Church. Follow the Holt Road for 3 miles. Kelling Close is the second turning on the right after the first 30mph sign.